The importance of teeth cleaning and regular dental checkups cannot be stressed enough. Dr. Ragozine realizes that most people live busy lives today, however it’s essential to take care of your teeth! Take care of your smile, and the chances of never having to get dentures or have other expensive procedures performed increases substantially. Prevention of gum disease. The build-up of plaque can result in gum (periodontal) disease. Plaque also contains bacteria which can cause inflammation and irritate gums. Maintain good health. Studies in recent years have linked strokes and heart attacks to gum disease. Although the correlation between the two isn’t clear, regular teeth cleaning could potentially lessen your risk of having a stroke or developing heart disease. Enjoy a whiter, brighter smile. Having your teeth cleaned helps remove stains caused by coffee, tea, wine, tobacco, and other products. Some medications can also cause teeth to become discolored. Prevent halitosis (bad breath). No one wants bad breath, which can be caused by gum disease, food lodged in hard-to-reach areas, or poor oral hygiene. 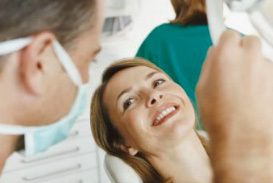 Regular teeth cleaning and dental checkups are the most effective way to ensure you enjoy good oral hygiene. Keep your teeth. No one wants to lose their teeth, but poor oral hygiene can result in advanced gum disease, which means supporting bone can be destroyed as plaque moves further into the roots of the teeth. Have your teeth cleaned regularly, and brush/floss thoroughly between cleanings. Examine your neck, throat, tongue, face, and head. While this may sound strange, a dentist can often detect signs of potential trouble such as cancer or swelling. Check for cavities. As mentioned before, you may have a cavity that you have not yet noticed, perhaps between teeth. Detecting cavities early makes for easier treatment, and often helps save permanent teeth which may be lost if decay progresses too far. Check for plaque and tartar build-up. When plaque is not removed, it becomes tartar which is impossible to remove with regular brushing and flossing. Plaque can lead to gum disease, so it’s important to take care of it before it gets out of hand. Examine your gums. Your gums can be a big indicator of your overall health, and potential gum disease. Your dentist will use a tool designed to measure the space between teeth and gums; spaces typically become deeper when gum disease is present. Now you can understand the importance of teeth cleaning and regular dental checkups both in terms of maintaining a healthy, beautiful smile regardless of your age, and overall health. Call Dr. Ragozine’s office today, and schedule your appointment!